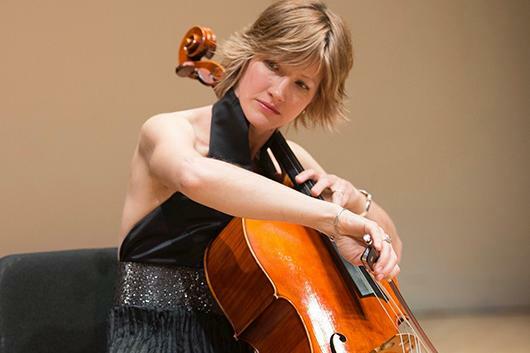 Canadian cellist Caroline Stinson performs widely as a soloist, recitalist and chamber musician and has appeared at Zankel Hall, Gardner Museum and the Smithsonian; the Koelner Philharmonie, Lucerne Festival and Cité de la Musique in Europe, and the Centennial Centre in Canada. In recent seasons she appeared in recital in New York sponsored by the Finnish Consulate, in recital in Brussels, Belgium, with Accroche note in Strasbourg France, and as a soloist with the Stamford Symphony CT, under Eckart Stier, where she also serves as Principal Cellist. Ms. Stinson has commissioned and premiered works from solo cello to concerti and has had the privilege of working closely with Pierre Boulez, John Corigliano, Peter Eötvös, John Harbison, Aaron Kernis, Paul Moravec, Shulamit Ran, Esa-Pekka Salonen, Steven Stucky, Joan Tower and Andrew Waggoner. As a member of the Lark Quartet, she will celebrate the group's 30 years with commissions from Harbison, Waggoner, Bunch, Weesner and Hatke. As a recording artist, Caroline's CD Lines was released on Albany and she has contributed to more than a dozen chamber music recordings with features on this continent and abroad. She has given masterclasses across North America and Europe, and teaches cello and chamber music at The Juilliard School. Caroline is Co-Artistic Director of Weekend Chamber Music in the Delaware River Valley.